Anything up to 50% of your body's heat loss is through your head, so a Beanie can make a massive difference when the cold weather swings into full force. Make sure you’re covered up and warm this winter, particularly when you have to step outside and leave the comfort of your home or office. Pull your beanie over your head before you step outside and you will stay warm walking to your car, driving home or taking a walk in the park. Rug up this winter in one of our classic promotional Beanies, Available in an Acrylic Beanie, Woolen Beanie and Fleece Beanie there is sure to be a custom printed beanie to suit your needs with our huge range of styles. Classic Cut Beanies include the Acrylic Beanie with embroidery, Cable Knit Beanie with custom logo and the Roll Down Polar Fleece Beanie available with full colour branding. Vivid Promos has a large range of beanies in many colour selections, we are sure to have one to suit your corporate colours such as Black Beanies, Navy Beanies, Green Beanies, White Beanies, Red Beanies and many more. Promotional Beanies presented with embroidery are a popular choice for sporting clubs as a form of team support with your clubs logo printed on the front, trades people to wear to work on those cold early mornings and everyday people as a fashion statement! Promotional winter products will last you years to come and will never be forgotten. Custom printed beanies are sure to make an impression wherever you go! Kid’s sized printed beanies are also available in a range of bright and fun colours such as Pink Beanies, Yellow Beanies and Orange Beanies. Custom branded Two Tone Beanies, Printed Beanies with a peak and embroidered Skull Beanies with stripes are great investments, Custom Printed Beanies are stylish, practical, and functional, and they won't break the bank. 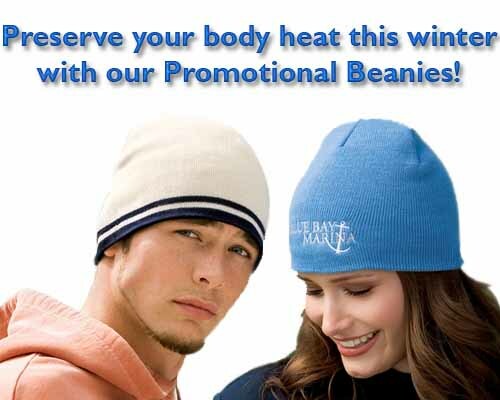 Take a look at more Information on our Promotional Beanies here!